Lens adapter manufacturer Metabones has announced new firmware for its Speed Booster and Smart Adapters that brings on-sensor phase detection autofocus to owners of Sony's Alpha 7R ll and the Olympus OM-D E-M1. Firmware version 1.8 for the Speed Booster and v0.43 for the Smart Adapter lends the products AF speed that the company says is comparable to that of the adapters sold by the main brands for their own products, but the Metabones adapter allows Canon EF and EF-S lenses to be used on the Sony and Olympus bodies. Owners of other Micro Four Thirds bodies get faster contrast detection AF, the quality of which depends on the age of the lens being used. According to Metabones lenses newer than ten years should work well, but older models and lenses from third party brands, such as Sigma, Tamron and Tokina, may not. All EF and EF-S lenses, and those from brands other than Canon, will work with the OM-D E-M1 once the new firmware is loaded to the appropriate Speed Booster or Smart Adapter. The company admits that there is no AF during video recording for Olympus users, and only very slow AF for those using the Sony A7R ll. Continuous AF may be slow when used on cameras that can enjoy phase-detect AF, and non-existent for those that rely on contrast detection systems. For more information, visit the Metabones website. Vancouver, Canada, September 18, 2015: Metabones® adds phase-detect autofocus (PDAF) support for Olympus OM-D E-M1 and Sony Alpha 7R2 to its EF-mount Speed Boosters and Smart Adapters through firmware update version 1.8, available from Metabones' web site for download. Free of any potential misalignment issues, on-sensor phase-detect autofocus is capable of attaining excellent accuracy. Overall, phase-detect autofocus offers a significant performance improvement over contrast-detect autofocus, and for shorter focal length lenses the autofocus speed approaches that found in digital single-lens reflex (DSLR) cameras. Performance, features and limitations of our solution are comparable to other on-sensor PDAF systems involving adapted DSLR lenses on mirrorless cameras, such as A-mount lenses on Sony Alpha 7R2 with LA-EA3 adapter, Four Thirds System DSLR lens on Olympus OM-D E-M1 with MMF-3 adapter or Canon SLR lens on EOS M3 with Mount Adapter EF-EOS M.
1. During video recording there is no AF (Olympus) or only slow contrast-detect AF (Sony). 2. Continuous AF may have unsatisfactory performance (phase-detect AF) or not supported (contrast-detect AF). Also added to Metabones firmware update version 1.8 is fast contrast detect AF for other Olympus cameras including E-M5II, E-M5, E-M10 and E-P5. Contrast-detect AF accuracy on Olympus is lens-dependent with most Canon-brand lenses introduced over the last 10 years working satisfactorily. However, some older Canon lenses and some third party EF-mount lenses may not be able to achieve pinpoint-accurate focus on Olympus cameras with contrast-detect AF. These lenses should be used on OM-D E-M1 instead. In addition, AF support for JVC GY-LS300 is added to this new firmware version. Existing Panasonic contrast-detect AF support is enhanced with 24p added as a supported frame rate for single-autofocus (AFS) during video recording. The following discontinued products must be updated by factory service. 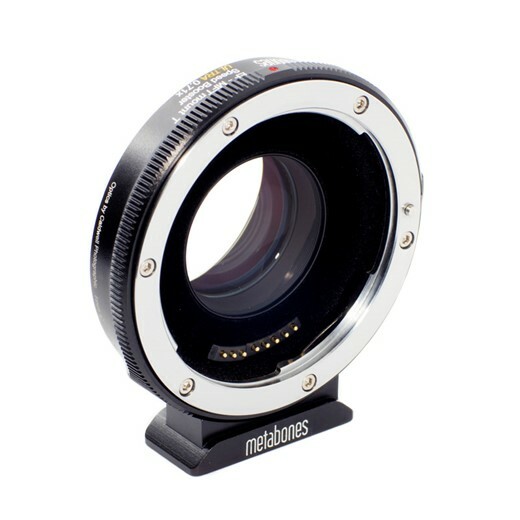 Please contact Metabones customer service for details. They didn't add it - they fixed it. OSPDAF for adapted lenses was one of the major features added by the A7RII - This worked with a number of existing adapters on the market (such as Viltrox' EF-NEX II - there was a demo posted of this working less than a week after the A7RII was announced.) I think only Metabones and the DEO Falcon needed updates for this to work. The big news would be adding OSPDAF support for older bodies like the A6000 - which Metabones hasn't done but DEO has with the Saker Falcon Lite. My Nikon lenses are very very lonely. Just buy a camera -- and lenses matching it in the first place. Simple, really. That'll put Metabones and all other gizmo-makers out of business, and do so rather quickly, I would surmise. People like using lenses other than their own mfg's on their cameras. Type in m4/3 or Sony adapter on Ebay and I think you get about 1500/50,000 entries. Or the manufacturers could standardize lensmounts and all lenses could be interchanged. That would also fulfill your goal of putting Metabones out of business. What's the point of putting them out of business again? That would force me to buy (and, for that matter, carry) more than one camera in order to be able to use the lenses I want to use. And it would force me to buy a camera I wouldn't really choose if it wasn't for the lenses. This is what adapters and focal reducers are for: getting the most out of all kinds of lenses while staying with one – possibly your favorite – camera. Which is why Metabones & Co. won't get out of business any time soon, although their stuff is not cheap. The lens itself frequently costs more than the prestige-name Metabones adapter that it is mounted on. 'Nuff said. Canon EF 5.6/400 L, Canon EF 2.8/300 L (IS) (or even longer L-lenses) for example will work with either the Metabones EF-MTF smart adapter or with the Kipon EF-MTF adapter, and where perhaps are differences. Kipon a few days ago has announced a new compatibility list, where all these Canon optics are included, we onlycan hope, that this is true. From Metabones there is no clear statement, only that older lenses may have problems. So special experiences with any of these lenses on these adapters with the new software attached would be very welcome. Been using the EF-E T Smart Adapter Mark IV (model number MB_EF-E-BT4) on my 7rII. I just installed this and so far has made a significant difference with my Canon 50mm f1.4 and 100mm EF macro. Before these would hunt and never focus. Now they will AF in decent light. Before the 50mm would sometimes (somehow) shut the camera down. That hasn't happened again so far. I have used both AF-C and AF-S. So moving in the right direction. Haven't tried other lenses yet (those already working). The camera does identify the lenses properly for anti-shake too it seems. Why would owners of A7R II needed SpeedBoster anyway. Why would they need adapter with PDAF ??? The speed Booster is for Olympus. Pdaf for faster auto focus. If the camera AF perform better with wider apertures it might be useful to get faster AF in low light condition, specially for longer tele-photo lenses that usually aren't that fast. Well, 4K in super 35 mode for a7rii looks better, and thus when you use the speedbooster you get an equivalent of a FF but with the superb super-35 4K quality. Makes sense? The DPReview headline is a bit misleading. The update works with glassless Smart Adapters as well as Speed Boosters. PDAF is faster and more accurate than contrast-detect af. PDAF is mostly faster than CDAF. It is not more accurate. PDAF requires products like lens align. CDAF is generally superior to PDAF for accuracy. Mirrorless cameras with on-sensor PDAF typically use a hybrid scheme where they use PDAF to quickly get in the vicinity of the right focus point and then use CDAF for final adjustment to get high accuracy. @Bernard Carns, random78: With DSLR lenses designed for PDAF, CDAF is either intolerably slow or inaccurate. It cannot be accurate and decently fast at the same time. Exceptions prove the rule. Phase detect is more accurate in mirrorless cams than DSLR because the phase detect sensors are on the imaging plane and not in a seperate module. Bernard Cams, you DO know who Brian is don't you? Can Brian walk on unfrozen water? I actually don't agree with him on many things but regards the Metabones speedbooster that this article is about? Who to believe....the bloke who designed the optics or some bloke on the innernetweb. I would like to see some comparisons of different adapters done by DPR. The Metabones M4/3 on both Panasonic and Olympus cameras, same with the Kipon EF to M4/3 adapter (now that version 2.5 firmware makes it more useable), The Metabones IV on the A7Rii and other A7 series cameras, the new DEO Saker Falcon lite adapter for EF to E mount with AF-C (on some cameras other than the A7Rii). How much do they charge for it? $1000 yet? The firmware ugrade is free. So, they does not raise the rise price if you did not have it already? Are you sure? Your question is confusing due to the double negative. From the press release: "By simply downloading and running Metabones App Version 1.8, new autofocus support is added to the following Metabones products: etc., etc." Only a few older adapters have to be sent back to Metabones for upgrading, and I expect then there would be some charges involved - at least for shipping, but contact Metabones customer service to be sure. Looking at the Metabones website, all of the pertinent EF adapters appear to remain unchanged in price. Does this work on the standard A7 too? in crop mode only is my guess. I guess that is why they are advertising it for the A7RII for its crop mode and high resolution sensor. A7rII video shooters and M43 shooters indeed. Very good question. Sony A7, A7ii, end especially A6000 and A5100 has quite decent PDAF support. I wonder whether this firmware update works with the PDAF of these Sony models, too? Sony has sold tens of thusands of these models, while only couple of hundreds of A7Rii. Metabones should focus on a much larger audience. I have had both types of adapter working at v1.7 on Panasonic bodies for M4/3 for a few weeks. They work very well and are a huge improvement on the MkIV EF to FE adapters even with the latest firmware on them. Upgrading to v1.8 was very easy and I have tried the adapters on an Olympus E-M10 body which might even focus a little faster.